The islands in Ocean Country have been celebrating the arrival of the next Umikage, Saizo. The long bridge leading to SHIPPUUGAKURE NO SATO has been closed for outsiders because they wish to celebrate this moment with Ocean Country natives only. As usual, the Storm Country has been hosting the Asgard Games to welcome their Kanetsukage, Cornelia. It's a double special occasion because Cornelia is also the first female Kanetsukage. She has been picked for her courage, loyalty and outstanding power by the BOUFUUGAKURE NO SATO elders. Not only that, but the Cherry Blossom Country has become relieved as well. It seems that everyone is slowly picking up after the war now. KUSAMURAGAKURE NO SATO proudly presented their new Sakurakage, Altair. TSUKIGAKURE NO SATO is still thriving on the merchants coming in and out. They have not experienced anything special lately. Their wealth has remained the same as they were not forced to invest into shinobi unlike the others. On the cold isles of the Blizzard Country, HYOUGAGAKURE NO SATO has still refused to create a free traveling policy. Some habits never change. To protect their traditions, they have even warned outsiders to not interfere with their matters. Now that everyone is picking up again, who will come out on top? It is possible to support the forum via donations. This is not required however so please do not feel obliged to donate if you do not wish to do so. We have created a system to thank our contributors though. You can read more about that by clicking --► HERE! Once you're sure that you wish to donate, click on the button below and follow the instructions given by PayPal. Please write down your username followed by Naruto Legacy in the extra notes section to get your points faster. Naruto Legacy was created by Nova and powered by FM. It is currently under the ownership of Eden. Contents, characters, plots, etc. are credited to the members. Please do not take anything that doesn't belong to you. If misconduct occurs, please notify Eden. © All other rights to the Naruto franchise are reserved by Masashi Kishimoto. Personality: Drakkon is a very shy person, he currently prefers to keep most of his face hidden, especially in the presence of people who know his name. This is done for one reason, and one reason only, to hide his hair, which is naturally a shade of hot pink. He considers this to be extremely girly, and as such doesn't want people to find out about it. He'll go to extreme lengths to keep that trait about himself hidden. Other than that he's about as average as you can get with someone who's shy and doesn't know how to communicate. He stumbles over his words especially when under social pressure, like if anyone asks him a direct question and people start looking at him. But underneath that shy and awkward personality stands another beast that awaits release in stressful situations. Drakkon has a dark side that when unleashed, does a total 180 from his original personality. It is fiercely protective, aggressive, competitive, and just downright full of rage. It will attack enemies and defend even people Drakkon doesn't know against attack without any reservation or hesitation. The key to unlocking this personality in Drakkon is extreme amounts of stress in a situation. This could be from him taking multiple hits, to someone being close to killing someone else. This side of Drakkon will stop at nothing to not only defeat, but annihilate the cause of its release. Drakkon is currently unaware of this side of himself, though while it is dormant he will experience urges to act on that personality. He has no memory of what the other half does, which at times is confusing for him. Likes: Friendly games, learning (of any kind), helping other people, trying to make friends, playing with pets or wild animals. Dislikes: Anything that involves cheating or bending the rules, being made to sit and watch someone else. Also doesn't like anyone poking fun at others or himself. Hurting animals. Motivation: He wants to do as much good as he possibly can by helping as many people as he can. He is also motivated to try and get over his current stage fright so that way he can be of more help. Fears: Confrontation, seeing any kind of death around him, being the center of attention, and did I forget to mention surprises, those are the worst. Bloodline Ability: From the point of the person using it, they either lose consciousness, or if they have great enough control, achieve a heightened state of awareness. During this state, their body runs on pure rage and adrenaline, transforming it into the deadliest of weapons, increasing speed, physical and chakra strength and how durable the body of the ninja is. 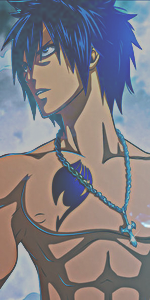 The amount of chakra generated and expended by this ability is tremendous, but comes at great cost. First of all, if the user has not achieved great enough control over this ability, it could activate subconsciously and put fellow ninja in danger. But the greatest threat is on the ninja himself. If activated for too long, it tears the the user's body apart, and has a significant chance (over 80%) of bringing the user's chakra to absolute zero, and killing them immediately. This ability is something that if not controlled, does more damage to the user than helps them, AND is a last resort ability that should only be used if the user's life is in danger. There are lesser releases of this ability that allow for smaller advantages to be gained, however, without as much risk, there nowhere near as much reward. These benefits are also limited to one area in a lesser release, as in it can only slightly boost one attribute of the user. The Lesser Releases are: Dragon's Eyes, Dragon's Strength, Dragon's Speed, Dragon's Might. Clan History: The Sahadow Clan was a group of ninja that were abnormally large in stature compared to other ninja. As such they were often considered first for their former position as body guards to people who's lives were either important or in danger. They were never boisterous about this position, instead living for what the task at hand was to be, which was often giving their lives to make sure the village would live on. They were often chosen for extremely dangerous assignments as each of the ninja from the Sahadow clan had one thing in common. The village came first, no matter what. It was for this reason they never chose to boast or reveal their clan's ability unless the people in question needed to know, not even to the children in the clan. They saw themselves as soldiers, tools, weapons for the Fubukikage, and nothing more. They never questioned their dedication to the Fubukikage, even when ordered into suicide missions because each member knew it was better for one of them to die, rather than any of the civilians in the village. One of the many standards of training for the Sahadow Clan was being able to live in the surrounding tundra alone, and with no equipment or even clothes. The ninja were forced to find a way to survive, or risk death from exposure. Once the ninja passed the first test, they were trained in the system where there was only one sensei to each apprentice ninja. The reason they conducted their own training instead was because of the need for the quality of ninja to be the highest. And only a Sahadow Clan ninja could provide that kind of training. This was also their downfall. Because of the harsh training measures, small amounts of new ninja being trained by them, and the willingness for the Clan's ninja to sacrifice themselves in battle, their numbers were dropped from a few thousand to barely a few hundred. So once the last war was over Kazangakure was over, the Clan has disbanded as a military force, and now works as fishermen and farmers. 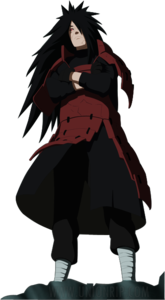 However, even though they are officially disbanded as a military force, many of the former ninja there await the call from the Fubukikage. The call that they will always heed. To fight and die for the village if that is what is required. History: Drakkon's story starts off humble, as he is the son of a family of farmers. They lived poorly, however they were happy with what they had. Drakkon's family was always a bit larger than life, the actual adults standing anywhere from 7 to 8 feet tall, and strong as the oxen they worked with making them ideal for working the fields. However one of the things that Drakkon was told of while a child was that his family, used to be a clan of Ninja, which while not ever extremely notorious, were good at what they did. He heard stories of how they would save the day, coming to people's aid and perform feats of bravery that no one should ever know about, but were necessary at the time. Drakkon hearing these stories, began to want the same life that he heard about. His father, seeing the zeal with which his son put forth into wanting that life, began teaching his son some basics, and then sent him to the local academy. It was there that Drakkon began studying with other children, however, two things became immediately apparent. His size, and hair made him stand out amongst other children, and as such he was picked on. But also, his size worked against him on that he was clumsier than the other kids. This caused him to have to work twice as hard as the other kids to master Jutsu, but he threw himself into the training. Taking a note from that the other kinds focused on his hair to pick on him, he began to wear a balaclava constantly. It was something that his teachers chided him on constantly, but after one of the teachers caught a student picking on Drakkon, it was allowed. 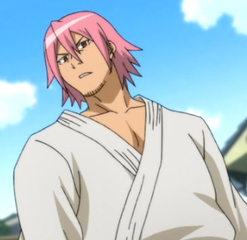 Without having to worry about his face being seen or his pink hair causing others to pick on him, he could focus on his training. And at first where he started in the back of the class because of his clumsiness, he began to pull ahead in the sheer tenacity with which he trained. His days consisted of runs, various exercises and physical strength building before class, and after school he'd work in the fields at home using the manual labor to build even more strength. It soon began to pay off. Towards the end of the school year, he was on his way to school when he saw one of the other kids that normally picked on him in trouble. Namely he was surrounded by three men that looked up to no good. Drakkon intervened, the three men told him to leave, a fight resulted. Drakkon had his first experience with his second half coming out then, losing consciousness as it came out and beat the men to a bloody pulp. When he finally came to the other kid was praising him for standing up for him. But all Drakkon could think about was helping the poor men, so he had the other kid help him carry them to a nearby hospital. This caused them to be late for school, but an explanation from both students got them only a minor punishment. That the teacher and Drakkon's father knew each other though, made it a different story at home. He was taken aside and told that he'd be no longer working in the fields, that instead his father would be taking him out for private lessons in the forest. So every day after school until he graduated, Drakkon would follow him out into the surrounding tundra, where his father would teach him finer points on how he needed to approach situations. It would be here that Drakkon learned the importance of making sure that he didn't let himself get into a situation where things like that would happen. It's also where he would learn how to live peacefully with animals of the tundra, from the wolves, to the birds and how to not disturb them. It was here that Drakkon learned how to hunt coming to understand that treating the wilderness with the same, if not greater, respect than people around him. Because of his father's training, Drakkon graduated in the top thirty percent of his class, and now his adventure really begins. RP Sample: Drakkon smiled as he ran from roof top to roof top, leaping from one edge to the next. It was currently after school which meant that he had to get home quickly, the snow crunching lightly under his feet as he moved with a grace that most people his size shouldn't possess. Seeing a building coming up taller than the others, he focused on a hanging lamp post as he made his next leap. His hand reached out and deftly caught the edge, swinging him forward as he landed running, managing to land his foot on the next lower post, and began hopping from post to post. He was focusing on his chakra to keep his traction, but using his own senses and body to keep his balance. It was something that his father had taught him while out in the tundra. Keep your eyes forward, and visualize each step. That way you see everything before it happens. Stay focused. He made another leap from the last post and skidded to a stop on the last building before exiting the town. There it was, the surrounding tundra. Home. He took a step and closed his eyes. His body reacted falling forward, and naturally rolling, relaxing as he impacted the snow, and rested into a crouched position. He breathed a sigh of relief as he mentally checked himself over and found that he was fine, nothing broken or even strained. That was always nice. He looked around and noticed that a cart was on its way back to the farms where his father and the rest of his clan worked. He waved it down as he jogged over to it, the man in the driver seat bringing the horses to a stop as he waved back. Nimbly Drakkon hopped up into the passenger seat as the much larger man smiled and spoke. "Ah, Drakkon, how goes schooling at the academy?" "It goes well Mr. Bea! Today I got to use some of the techniques that father has been teaching me!" "Heh, that's good Drakkon, and which techniques were that?" "It was the one where it allowed me to talk to wolves! It was cool! I could actually see and smell the same thing that the wolf was telling me, just like father said! It helped us reach the point that we were supposed to hike to,"
"Ah, the Animal Link, you didn't try to teach it to others did you?" "No sir, I respected father's wishes," he puffed up his chest as he tried to imitate the man "Everything I teach you, is for you to know, and you alone,"
"Good boy, the reason our jutsu remains secret is because you must remember that there are those out there that would use it to do evil,"
Drakkon cocked his head to the side a bit. "What do you mean Mr. Bea? What kind of evil?" The older man shook his head as he spoke in a warning tone. "There are those that would use our abilities against not only the clan, but nature itself. For example, you know the animal link that your father taught you?" He paused as Drakkon nodded "Imagine if some poacher got his hands on that jutsu? He'd not only use it to kill animals, but to find their kits and destroy the natural order. He'd be able to kill recklessly, and would use it to ruin the great landscape that you see around us. This is why our Jutsu must only be used by those who would never upset this order, and use it only for good. Do you understand Drakkon?" "Yes sir!" The proud ninja nodded vigorously. "Good, now when we get home, you can help me unload the bales on this wagon for our livestock, it looks like winter will be cold this year. Do you think you can help with that?" "Mhmm I'll take care of it Mr. Bea, you can count on me!" Drakkon proudly spouted. The older man chuckled as he spoke and they settled into the drive. "Spoken like a true son of Sahadow,"
Hi, how are ya Drakkon! I'm going to be reviewing your app today, so let's get started, shall we? Shadow isn't an element, so if you can edit that to one of the six basic elements, that'd be super. Genin are allowed up to two specializations, so you can have Kenjutsu as your secondary, if you so desire. Fix everything that I asked you to please, and then bump this topic upon completion so we can continue. Thanks!